The ranch-style Avalon plan greets guests with a covered front porch. The home also offers a formal dining room a spacious great room with fireplace and a kitchen with gourmet features. The kitchen has a center island that faces the great room which is ideal for entertaining, a walk-in pantry, and a nook for a non formal eating area. The master suite features a deluxe five piece bath with his and her vanities, and a large walk-in closet. In the finished basement you'll find a rec room, two bedrooms and a 3/4 bath. Blackstone Villas is part of the Blackstone Country club master plan which offers high end amenities, in a golf club community. 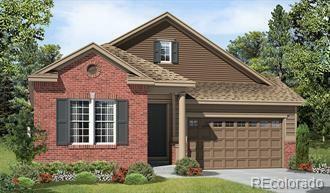 Convenient location close to E-470, Southlands, and the DTC. This home is available for move-in!